Canadian canola expert Phil Thomas says producers can improve yields with innovative technology and better farming practices. Kobus van Tonder reports on Phil’s recent visit to SA. Phil Thomas of Canada believes increased production will be achieved by raising the general level of agronomic practices rather than by improving genetics, although the latter is also important. Canola is currently enjoying five-star status because of its excellent performance. On the surface of things, this could be ascribed to better genetics and improved farming practices. Look a little deeper, however, and you find bold farmers and daring institutions laying the groundwork for the real success of local canola. This industry is a rarity among commodity groups, co-operating and exchanging information in a continuous loop between growers, agronomists and researchers. Challenges are jointly addressed in a unified attempt to increase yields and improve quality. As part of a problem solving mission, well-known oilseed specialist, Canadian Phil Thomas was invited to South Africa by the Protein Research Foundation (PRF). 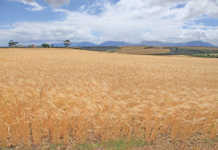 Phil was tasked with reviewing South Africa’s canola industry and assessing its production potential. Author of the internationally recognised Canada Canola Growers Manual, Phil’s development of the Alberta Rapeseed home study course was instrumental in helping many Alberta farmers learn how to grow this crop. In a recently published review of the SA canola industry, he says that a big increase in canola production in SA will not be achieved through genetics or increased hectares only and that there must be improvement in on-farm production practices. It is said of Phil that there aren’t many canola lands in Alberta that he hasn’t walked on looking at crops, teaching or demonstrating. He walked his talk here too, last August, when the Cape’s lands were in their prime, making visual evaluations of canola cultivar trials and farmers’ lands. Phil went to areas with average to above-average rainfall in the growing season. He said they “clearly showed high yield potential (1,8t/ha to 2,5t/ ha) with some excellent agronomic management”. “Unfortunately, average lands throughout all areas showed that the largest constraint to canola productivity generally is the level of application of known agronomic practices that increase and protect yield,” explained Phil. 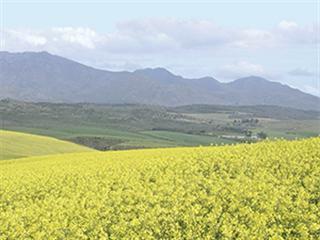 nHe says that farm yields in the Swartland and Southern Cape areas are poised for a further increase in the next few years now that canola hybrids are becoming more widely used by producers. Development of higher yielding, drought-tolerant, nitrogen efficient, herbicide-tolerant varieties with resistance to shattering, sclerotinia, blackleg and insects would enhance canola production in South Africa, he says. Because South Africa has no canola breeding programme, Phil recommends that the industry develop contacts with international canola breeding programmes so that more cultivars can be included in the elite varietal trials. He evaluated the varietal testing trials, and found them well managed. They provided excellent information to canola producers, which helped them select the best performance for the environment. Phil says the relatively small number of trialists was a problem, especially in the elite trials. 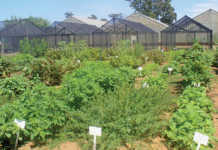 In plant breeding, the more cultivars developed and tested, the greater the probability of selecting varieties better adapted to a specific environment. According to Phil, research studies in Canada have shown that hybrid canola varieties have yields ranging from 15% to 45% higher than those of the open pollinated varieties. “Unfortunately, most studies have focused on increased production potential from genetics and bigger lands when considering the requirement for increased canola production. “While these two factors will contribute to increased oil and protein production, the major increase in production will be derived from improved agronomic practices,” says Phil. He says that the producer price for a particular commodity mostly determines what farmers will grow. There are, however, other factors that may influence the producer’s decision, such as soil and environmental and climatic factors. For example, growers may choose not to plant canola when soil conditions are very dry at optimum planting time, switching to crops that can establish under these conditions. Canola does not perform well on poorly-textured shallow and sandy soils. Phil found moisture was the most significant constraint to dryland canola production in the Cape. “I have estimated the average water use efficiency at about 160kg/ ha per 25mm of water. This level of efficiency could probably be raised to over 280kg/ha per 25mm of water with optimum agronomic practices such as balanced fertiliser applications based on realistic target yields. “With optimum agronomic practices and a water use efficiency of 280kg/ha per 25mm of water, a yield of 1,96t/ ha should be realistic with a rainfall of 25mm at seeding and 250mm during the growing season.” He says that the first 100mm of water is used up in the plant’s ‘factory process’ which leaves 175mm for yield. 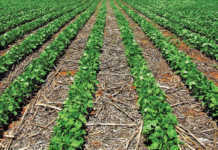 In the Cape’s lower rainfall regions, more attention should be paid to agronomic practices such as optimum plant density for the dryland crop. Plant population densities at lower rates handle drought better than higher population densities. Planting shallow into a firm, moist seedbed, balanced fertility for a targeted yield and fertiliser placement (split-applied with the seed and banded to reduce seed and seedling mortality) are all worthy of proper attention. So too is the correct timing of foliar nitrogen applications for protection of plants from pests. fertiliser rates should match a targeted yield based on soil moisture and precipitation. Because many soils are shallow, with a tendency towards a low pH, low organic matter content and poor soil structure, it is important to follow recommendations for required nutrients and timing of nitrogen fertiliser applications. Following a formula, without taking additional rainfall into account, resulted in many of the lands he observed running short of nitrogen at flowering. This is shown by early senescence of lower leaves. Referring to the new herbicide-tolerant hybrid varieties, Phil says they revolutionised canola production in Canada and enjoy an overwhelming market share. Worldwide, there is major investment in canola genetics and superior trait development. In his review, Phil proposes that these advances be considered for potential use in South Africa. The development of drought-tolerant varieties would have a major impact on improving moisture use efficiency and have a knock-on effect of increasing hectares planted and yields obtained. Cape canola growers would benefit from varieties with better shattering resistance, enabling them to straight combine, a time and money saver. Retarded shattering would also reduce losses due to wind. According to Phil, these varieties will probably be available in Canada within the next two to three years. Crop height is also a concern for producers as taller crops tend to lodge more and are tricky to handle with harvesting equipment. Difficult handling can cause harvest losses. “Nearly all the varietal trials and producer fields observed showed reasonable stand establishment with a good plant density. “The recommended seeding rates in the SA Canola Production Manual were established to obtain a plant density of 50 plants per square metre to 70 plants per square metre and most lands were in this range,” says Phil. “However, knowing the variability of thousand kernelweight of seed from different varieties could help producers fine-tune their seeding rates for optimum plant density.” Canola producers in South Africa face the same challenges as those abroad. It’s about testing the limits of intensive crop management and extracting as much value as possible from existing genetics. This needs an approach which gets back to the basics of good agronomic practice, like seed quality, and pushes the boundaries of new technology and knowledge, such as nutrient and soil management. Given the current prices and the margins to be made, there is interest in intensive management and care of canola. Phil says he looks forward to progress in canola research.